The Camry is let down by its driving dynamics. Picture: Joshua Dowling. The SX is the third grade up in the Camry range. We tested the four-cylinder but this grade is also available with V6 power. Standard fare includes built-in navigation, leather upholstery, power adjustment for the driver's seat, AM/FM and digital radio and CD player. Service intervals are 12 months/15,000km and routine maintenance is a low $585 for the first three years. Warranty is short at three years/100,000km. The Camry has head-turning looks. Picture: Joshua Dowling. This is the best looking Camry to date. You know the tables have turned when it's a sharper design than the Holden Commodore of the day. In addition to its sleek and stylish appearance, it's incredibly practical, with ample room front and rear and one of the biggest boots in the class. The low window line provides good vision all around. The 2.5-litre four-cylinder (135kW/235Nm) is no ball of fire but it gets the job done without fuss and is happy to sip regular unleaded. It works well with the six-speed auto, driving the front wheels. It's a touch thirstier than the Mazda according to the fuel rating label (8.3L/100km) although both cars were on par in real world testing. Comprehensive safety kit includes autonomous emergency braking, lane wander warning (although not lane-keeping), blind spot detection and rear cross-traffic alert. Front and rear sensors and a high-resolution rear camera help avoid parking bumps. Seven airbags protect occupants. 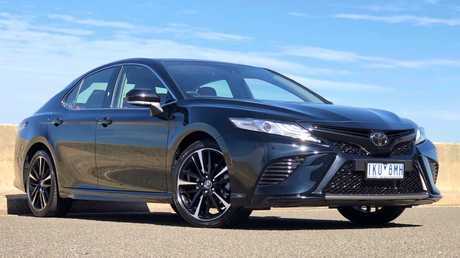 Despite its sporty appearance and the massive 19-inch wheels with low-profile tyres, the SX is not the sweet spot among Camrys when it comes to driving dynamics. The tyres are noisy and the suspension isn't very forgiving. The pick of the Camry line-up in terms of comfort and handling is the base Ascent. The Camry has one of the roomiest cabins in its class. Picture: Joshua Dowling. 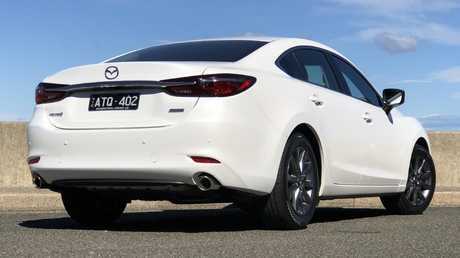 This is the cheapest ticket into the Mazda6 range, updated earlier this year. Standard fare includes built-in navigation and AM/FM and digital radio. Apple CarPlay will be available as a Mazda accessory later this year. 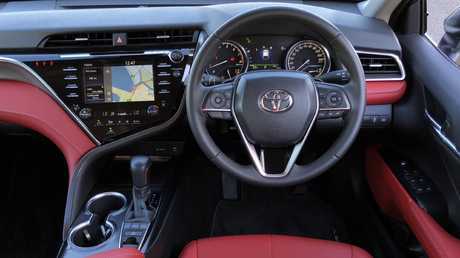 There are user-friendly controls in the centre console for audio and nav. Service intervals are 12 months/10,000km. Warranty is five years/unlimited km. Three years' servicing is expensive at $1429. Not as daring as the Camry but still a sharp-looking car with a touch of class about it. 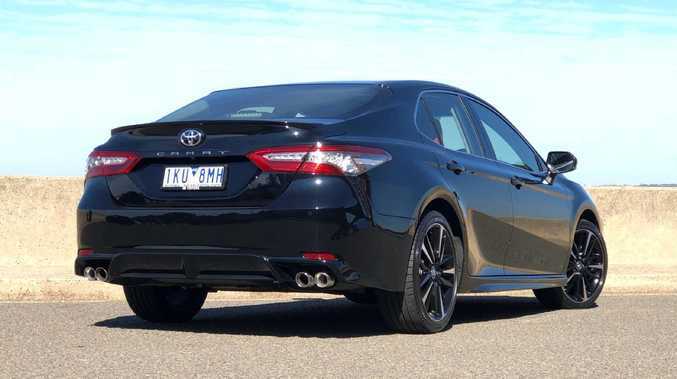 External dimensions are almost identical to those of the Camry but the Toyota has a bigger boot and more cabin space. Quality of the materials is excellent and the fit and finish are class leading. The Mazda6’s design is sharp looking but still classy. Picture: Joshua Dowling. Mazda's 2.5-litre four-cylinder (140kW/252Nm) has a bit more pep than the Toyota. Matched to a six-speed auto also, it gets the job done smoothly and relatively quietly. It's more frugal than the Camry (7.0L/100km) according to the label but in our testing both were in the high 8s and 9s with a mix of city and highway driving. Autonomous emergency braking is standard as are blind spot detection and rear cross-traffic alert. Unique to the Mazda in this comparison are lane-keeping assistance and speed sign recognition, which uses a camera rather than nav data. It works incredibly well and I missed it after handing the Mazda back. Six airbags protect you should the worst happen. 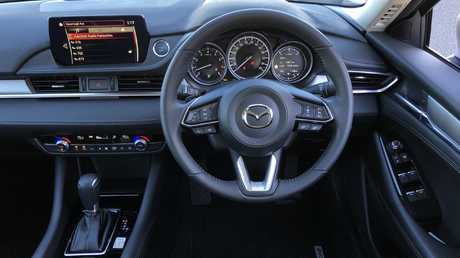 Mazda has used high-quality materials throughout the interior. Picture: Joshua Dowling. It might not look as sleek on 17-inch wheels wrapped in regular profile tyres but this is one sweet drive. There is ample grip in corners and the tyres and suspension are way more forgiving on bumpy back roads or the daily grind. This is a sweeter drive than the Camry and up there with the best front-drive sedans. The Camry looks the part and has more equipment but the updated Mazda6 is the better drive and has a longer warranty.